The Zodiac Birth Sign of Pisces is ruled by Neptune. The Pisces symbol, featuring a pair of fish swimming head to tail in a circle is representative of life after death or reincarnation. Pisces are governed by a duality, a struggle of the spiritual soul within the physical body. Pisces are deeply creative and artistic, with enhanced intuitive abilities. Pisces is the last of the twelve zodiac signs. Pisces make great friends and romantic partners. Pisces are the most impressionable of the twelve zodiac signs. Deeply empathetic, they often exhibit a gentle, patient nature, but one that is in want of inspiration. Pisces can be deeply affected by and completely absorbed into their environment. Pisces adapt well to their circumstances, both good and bad. They are generous, amiable, positive natured people with a deep sense of kindness and compassion. Pisces are highly tuned in to everything around them including the feelings of others. Pisces are socially popular because of their easygoing and likable manner. They have an uncanny sense of perceiving what a person wants or needs, and delivering it. 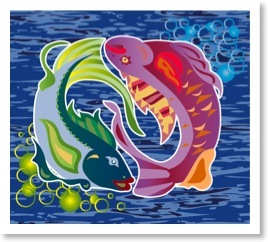 Pisces are reflexive, preferring to allow circumstances and events to unfold and, only then responding. Pisces are not typical people. They are too idealistic and impractical for every day run of the mill living. Pisces are sensitive and instinctual rather than bookish or mechanical. When Pisces find the right situations, they are capable of some incredible deeds. Pisces completely and wholly engage in a chosen path, to the exclusion of everything else. This obsessive compulsive energy can be healthy and not. Pisces can be workaholics (and other kind of -aholics too). Discover what makes Pisces the unique, creative fish they are! Pisces excel in situations where they can leverage their imaginative and intuitive nature. They are exceptionally gifted artistically. Pisces are often intensely interested and skilled at a wide variety of things and tend to learn by absorption as opposed to logic. Pisces are loyal, family oriented, kind and giving. They are receptive to new ideas and circumstances. Pisces have an uncanny ability to nurture and support which is directly related to their powerful intuition. Pisces make profound artists of all types because they possess great, vivid imaginations. That powerful creativity is often expressed in music, literature, drama and art. Pisces love style, luxury and pleasure, and are always ready for new adventures. When Pisces travel, they enjoy unique, exotic, luxurious places as well as modest, indigenous settings where like to live as the locals do. Main positive personality traits: Uncommon ability to instinctively respond to given situations; compassionate; understanding; artistic, sacrificing. Pisces are often scatterbrains. They don't do well in highly structured or regimented situations and generally buck convention. Pisces can be so emotional, needy and intense that they can end up being a real drag to people around them. In business, Pisces can be unreliable, unmotivated, easily distracted, and have their heads in the clouds all the time. The not so nice side of Pisces manifests as being a gossip, indiscreet, and gullible. Pisces are easily lied to because they so want to believe. No matter how often they are led astray by empty promises, they keep the faith and push on toward their personal ideal. Their dreamy and impractical natures can be a source of distress to those close to them. Being both optimistic and cynical, Pisces find it difficult to make up their minds on any issue. Main negative personality traits: Lazy, impractical, unrealistic, fearful, emotionally restrained, melancholy. In the career department, Pisces are often better working for themselves than for someone else. Their innate sympathy equips them for careers in charity, catering to the needy, as a nurse, looking after the sick, or as a veterinarian, caring for animals. Pisces have an intrinsic love of water, and are particularly well-suited towards jobs that keep them near the sea. Pisces notable creativity includes a natural ability to imitate or mirror another person as well as enter into their feelings. These attributes also make Pisces incredible character actors, and many Pisceans find great success on stage or in films. 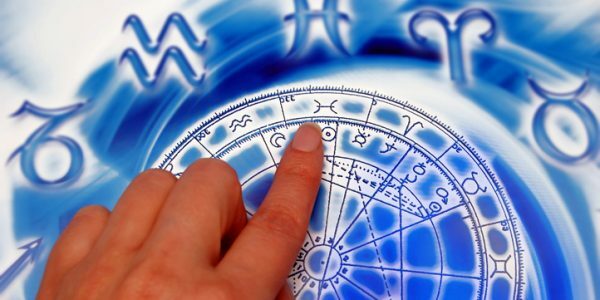 Pisces make fantastic salespeople, copywriters, marketing creatives and advertising executives. The much vaunted Pisces empathy for others makes them very effective in civil service and in the legal arena, particularly as an advocate for the less fortunate. Many police officers, attorneys and judges are Pisces. 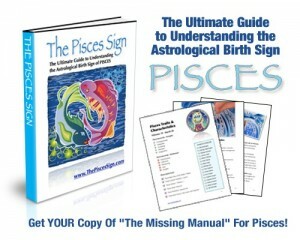 Pisces intuitive and metaphysical nature can lead them into careers in religion or to service as mediums and psychics. The search for spiritual meaning is never-ending for Pisces and a work situation that helps them follow this quest can be deeply rewarding. Owing to their versatility and adaptability, Pisces can often follow several radically different career paths during their lifetime. For example, it is not at all uncommon for a Pisces to work effectively in one long-term "day job" capacity, while pursuing a radically different "passion" after work or on weekends. Where others may feel encumbered by their work identity, Pisces chameleon-like capacity for change allows them to shed their skin and pursue things others can only dream about while stuck in their rut. When Pisces feel rejected or get the blues, they REALLY get the blues. Pisces are easily lured to drugs or alcohol for escape or distraction. Pisces should avoid this for obvious reasons, but particularly because of their highly addictive, compulsive nature. Pisces can easily develop a variety of vice habits including excessive gambling, compulsive shopping, and overspending. Pisces can suffer from a general lack of decisiveness and are easily distracted from their objectives. Pisces have a propensity towards depression and restlessness when not feeling fulfilled. They should live in sunny, warm climates, close to bodies of water. Pisces should be ritualistic about exercise and fitness in order to fight back melancholy. Pisces must make a concerted effort to avoid their restlessness and desire to do something new in order to succeed and make their life work better.